High blood pressure increases your risk of heart disease and/or kidney disease and stroke. In the majority of cases diet modification can have a considerable impact on high blood pressure. Diet changes should include minimizing consumption of salt, dietary fat - especially saturated fats, cholesterol and sugars. 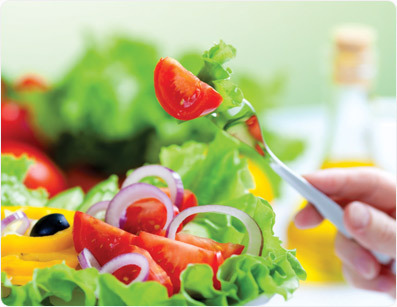 Focus on foods that are high in fibre such as whole grains, vegetables and fruits. As well as foods high in calcium, potassium, magnesium and protein which included low fat dairy products and lean meats and alternatives like poultry, fish, nuts, beans and lentils. Our unique healthy recipe search engine allows you to choose recipes that are best for you. Start by selecting ingredients to help manage your condition. Foods high in fibre include whole grains (whole wheat flour, brown rice, whole grain pasta), colourful fruits or vegetables, low fat dairy and lean meats and alternatives such as beans and lentils. Avoid recipes with added salt and solid animal fats such as butter or lard. Sign up to unlock personalized High Blood Pressure nutrition tools & features.